That's Gina McCarthy, Administrator of the U.S. Environmental Protection Agency, on the left!! Not only did we present our PowerPoint to teach our peers about climate change and energy conservation, but we also launched a “no-idling” campaign to help raise awareness of the negative effects of idling vehicles. 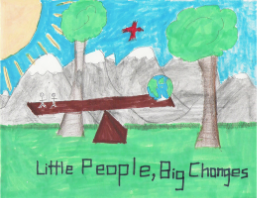 We got a bunch of kids together to create posters, and we hung them all over our town of Wilton, CT. We learned that idling your car for ten seconds or more uses more gasoline than it takes to turn the car off and back on — hence our no-idling slogan: “If you’re stopped for more than ten, turn it off and on again!” We made bumper stickers with that slogan to spread the word. Through our no-idling campaign, we were able to convince many adults, including parents of our classmates, to idle their cars a little bit less every day in order to reduce their carbon dioxide emissions. 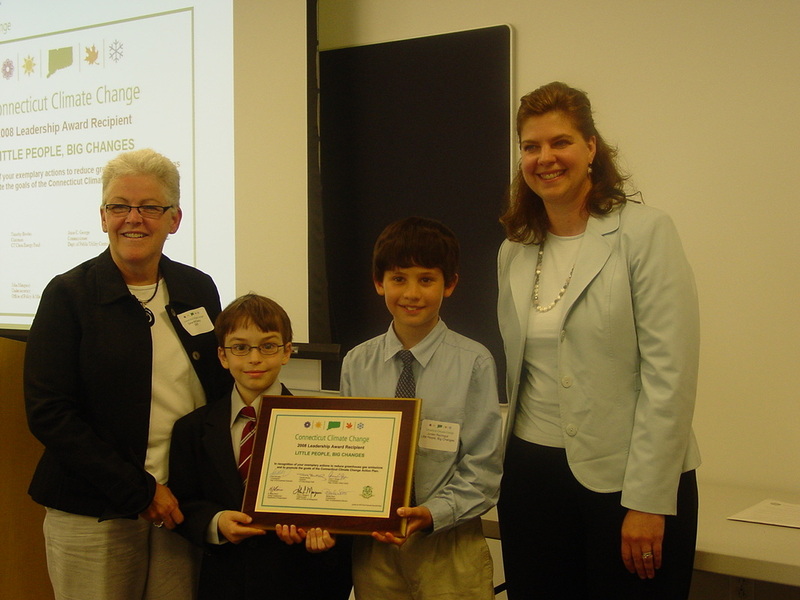 In 2007, we learned about the Connecticut Clean Energy Options Program. This program supports renewable energy sources, such as wind and solar power instead of fossil fuels and nuclear energy (which creates hazardous waste). Prices have gone down since we first worked on this program, and it now costs a little more than 1 cent per kilowatt hour (kWh) as a surcharge on your electric bill. That would add up to about $7 extra per month on the average electric bill. We’ve both signed up our households, and we’ve solicited over 200 sign ups in the town of Wilton since we started the clean energy campaign — and as a result we earned Wilton two free solar panel systems (normally worth $20,000 each!) They are currently installed on the roof of Wilton High School. Our work cannot end as long as our planet is so polluted and damaged. We must conserve and be more mindful of our use of resources in our lives -- from our energy use to the foods and products we consume. Please join us. You're all welcome - regardless of how big you are.